DWHoops Members may log in to view an additional 73 photos on this page - 49 free photos are below. Our photo galleries are entirely member supported. For information on becoming a DWHoops member for the 2010-11 season, please click here. Chloe Wells had a shaky shart, taking shots with a high degree of difficulty like this one before she found a groove. 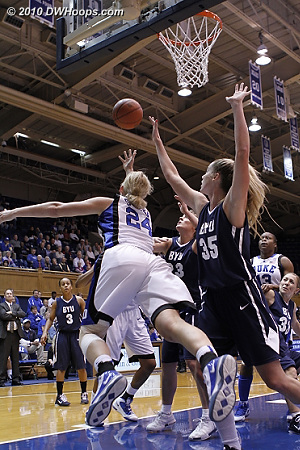 BYU got many open shots in the first half like this one from Mindy Bonham. 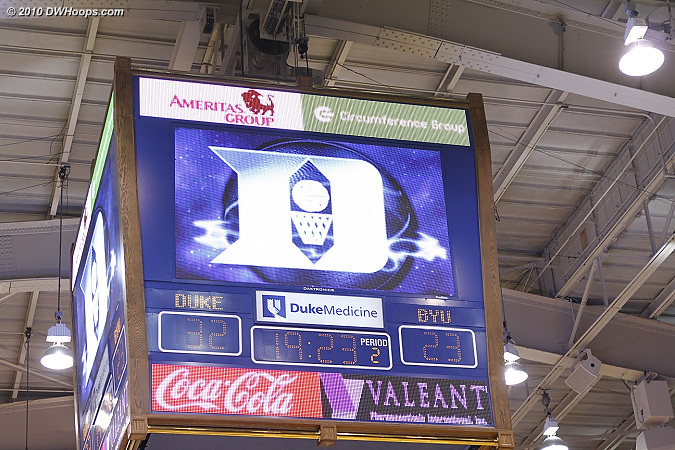 BYU ran out to an early 8-0 lead, forcing a Duke time out. 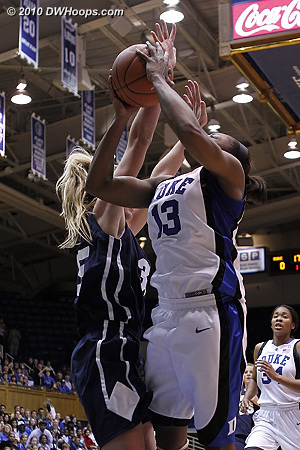 Karima ended the Duke drought by going right to the rim. Kathleen Scheer attacks the basket in her new more comfortable power forward role. 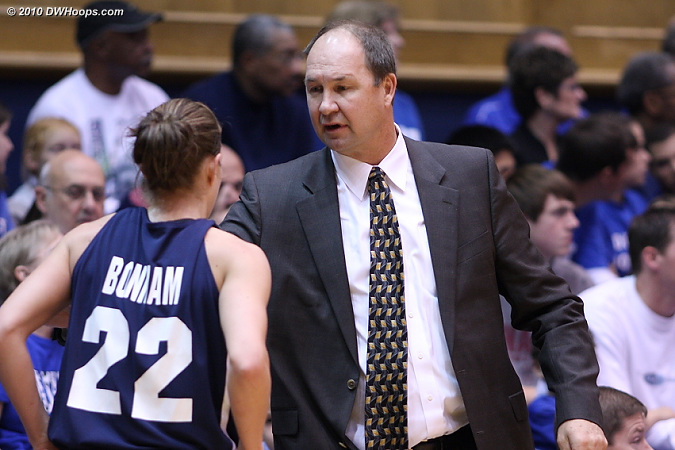 BYU Head Coach Jeff Judkins speaks with Mindy Bonham after a Cougar turnover. 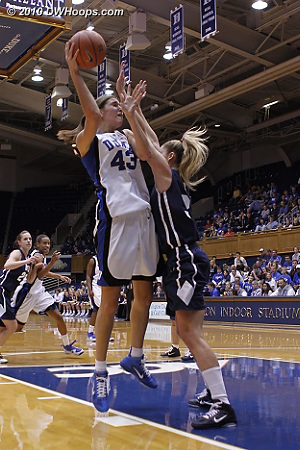 Tricia Liston was clearly nervous on the line in her first Duke outing. She was an 87% free throw shooter in high school, but here she missed both tries. 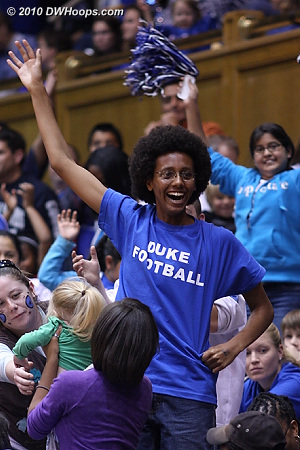 A Duke football fan in the house on a day when many fans enjoyed the rare football / women's hoops doubleheader. 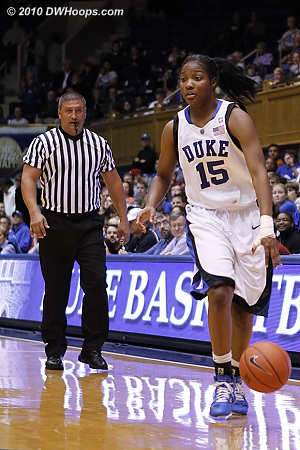 Jasmine Thomas had a tough first half from the floor, so she stepped up her game in other areas. "Your father wanted you to have this when you were old enough..."
Veteran official Bryan Enterline watches the dribble of freshman Richa Jackson. 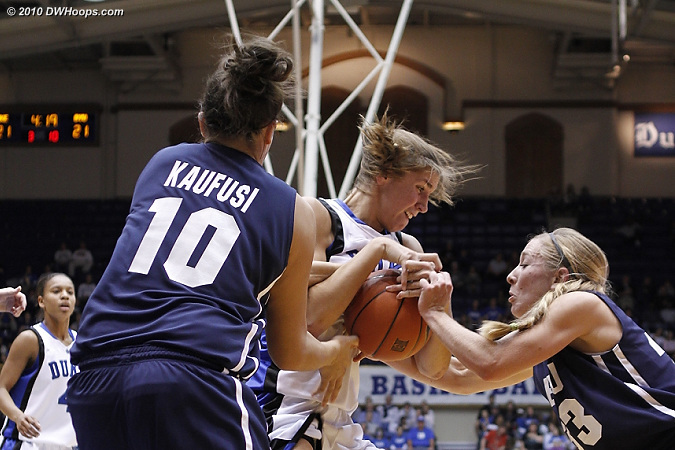 BYU's Haley Hall (right) and Alexis Kaufusi tie up Allison Vernerey. 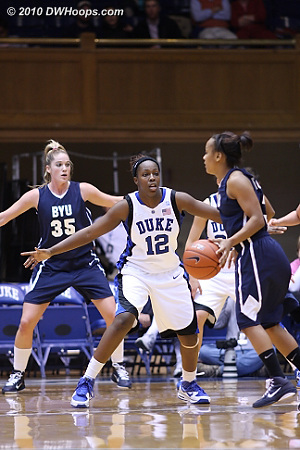 BYU guard Haley Hall gets an open look as Chloe Wells can't get there in time. Hall was 2-8 from distance. 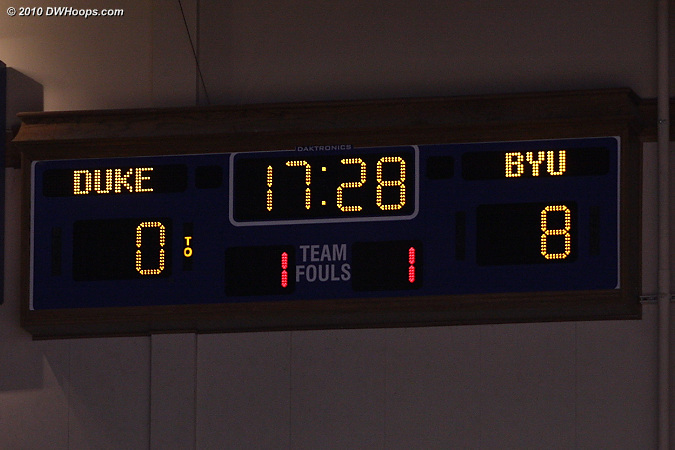 Chloe Wells scores on an amazing twisting shot that BYU's Alexis Kaufusi is powerless to stop. Chloe Wells releases a shot just over the outstretched hand of BYU's Haley Hall. 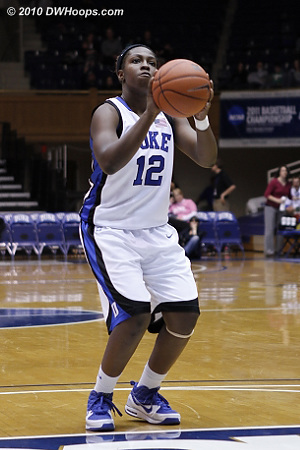 Jasmine Thomas fires a three point attempt. 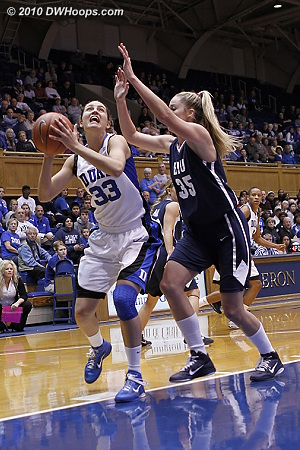 Haley Peters scored her first points as a Blue Devil from the line. Chloe Wells on the line, her free throw technique involves holding the ball to one side before centering it and releasing. Haley Peters calmly took the ball coast-to-coast to score just before the first half clock expired. Krystal Thomas gets what looks like a clean block, one can only imagine that the foul was called due to contact from her other hand or the body. 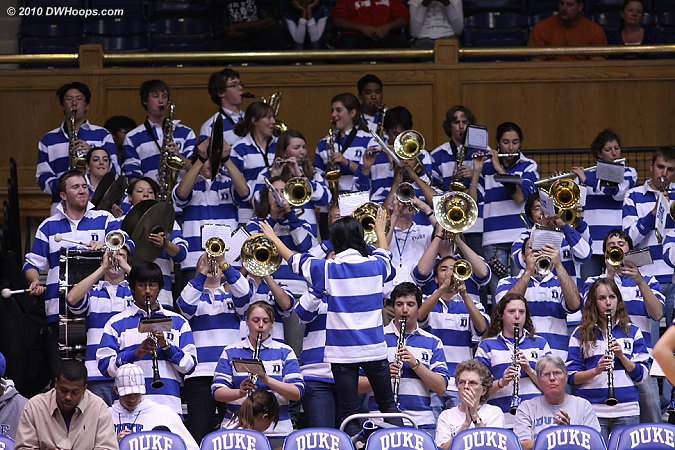 The first "palindrome" of the 2010-11 season, we thank the Duke Pep Band for taking note of such phenomena. 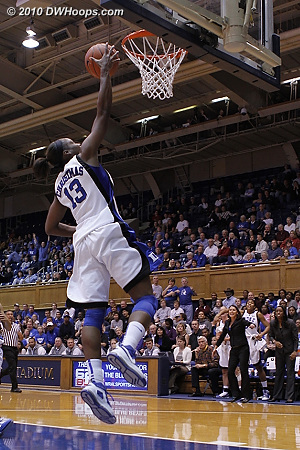 A beautiful reverse layup for Karima. 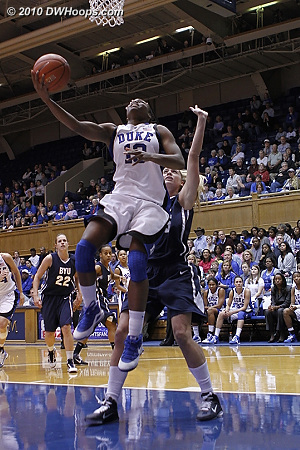 Another nice layup by Karima Christmas. Allison Vernerey gets good position to score. 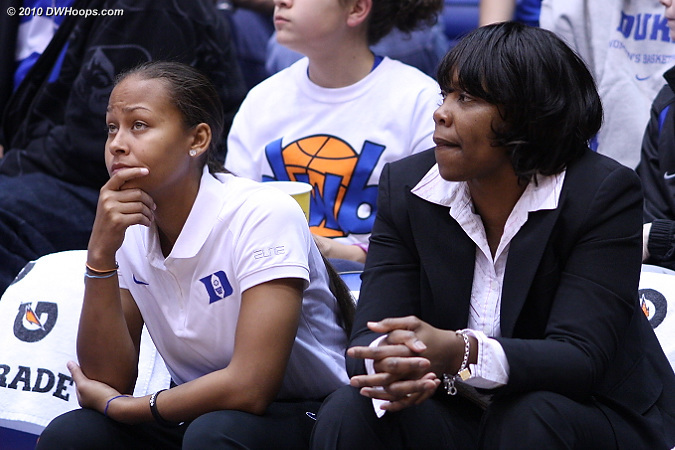 Shay Selby contemplates what might have been after what would have been her first career start was nixed by a groin injury suffered in practice. 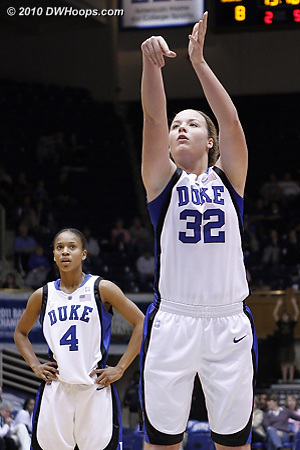 Since moving to the four Kathleen Scheer has found new confidence from three point range. Back-to-back hoops from Scheer and Wells put the game out of reach. 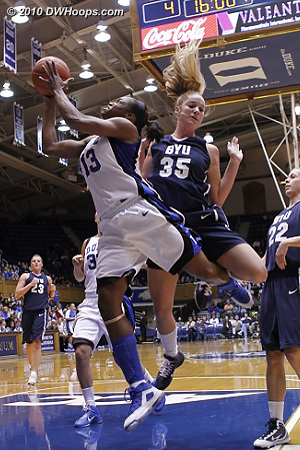 Chelsea Gray draws a foul from BYU's Stephanie Vermunt. 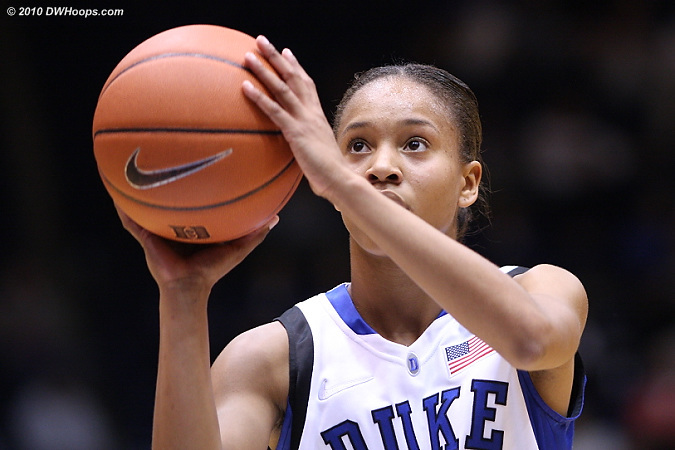 Gray's first career points came from the free throw line as she made one of two. 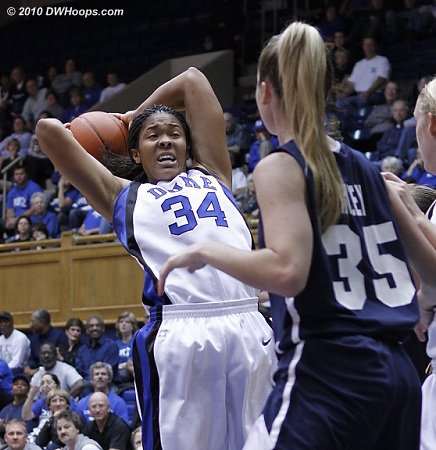 Krystal Thomas in the low post. 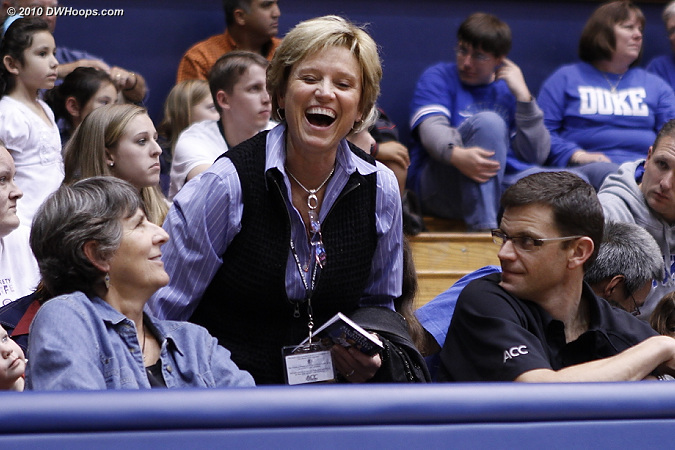 ACC Associate Commissioner Nora Lynn Finch (center) shares a moment with Duke Associate AD Jackie Silar and ACC Director of WBB Operations Brad Hecker. 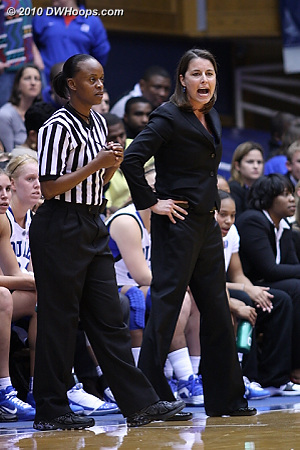 Allison Vernerey (right) is pleased by a call while BYU's Haley Hall has hurt her hand. The Duke Pep Band still going strong after a long day -- in their marching incarnation they performed at the Duke / Boston College football game, honoring their senior members. 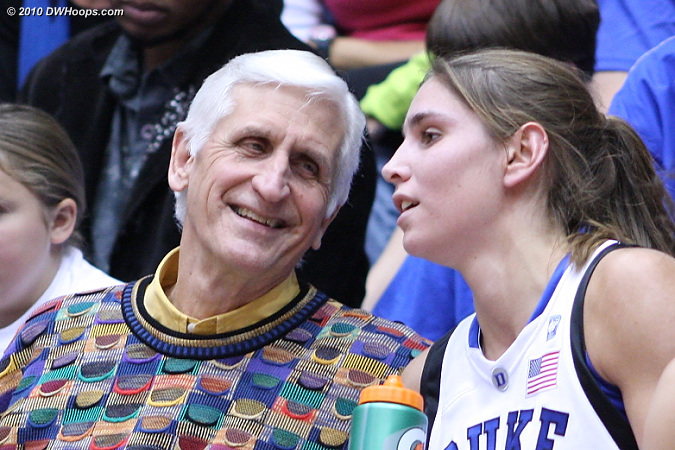 Al Brown with Allison Vernerey on the Duke bench. 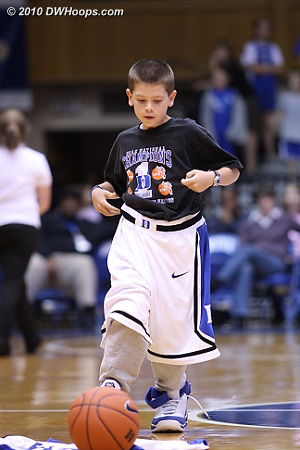 Scheer hits another basket as Duke pulls away. 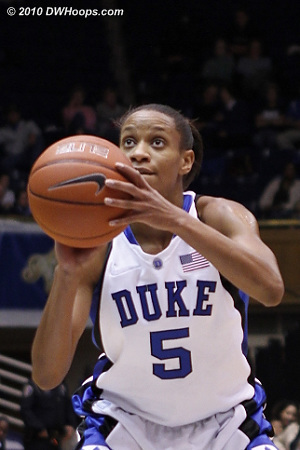 Chloe Wells has just dribbled out the clock, Duke defeats BYU, 69-54. 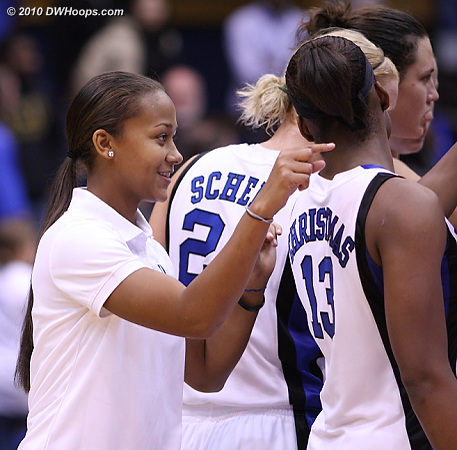 Shay Selby with a word for top scorer Karima Christmas in the postgame huddle. 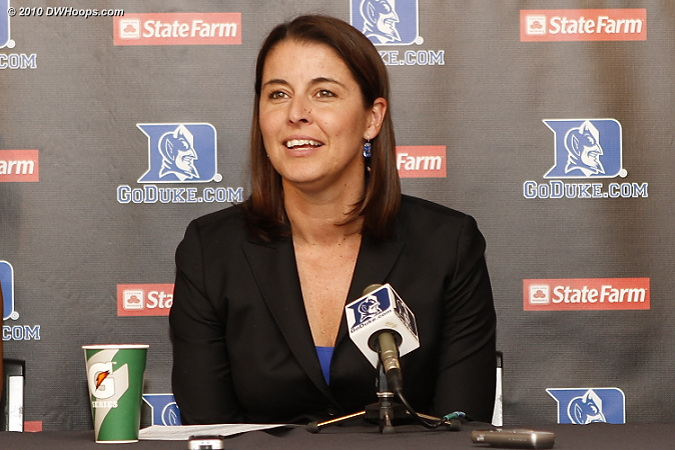 Coach P in the media room. 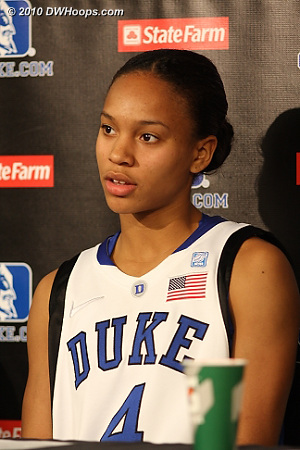 Chloe Wells in the media room, her first game as a Blue Devil was a good one. 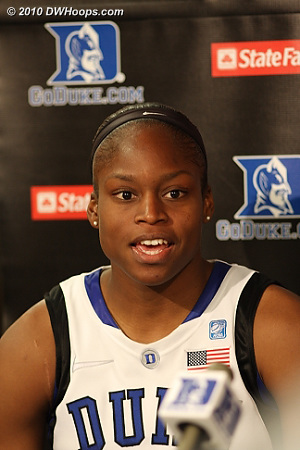 Karima Christmas led all scorers with 20 points. 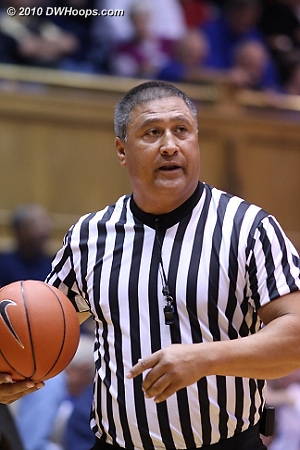 Getting to the line 12 times helped Duke not only in the points column, it also put BYU starters on the bench with foul trouble.